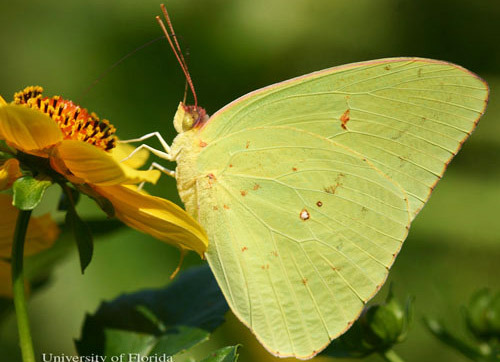 The cloudless sulphur, Phoebis sennae (Linnaeus), is one of our most common and attractive Florida butterflies and is particularly prominent during its fall southward migration. Its genus name is derived from Phoebe the sister of Apollo, a god of Greek and Roman mythology (Opler and Krizek 1984). 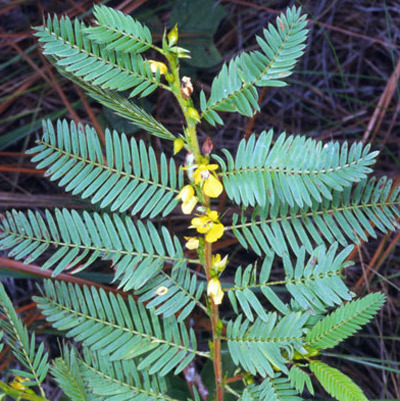 The specific epithet, sennae is for the genus Senna to which many of the cloudless sulphur's larval host plants belong. Figure 1. Lateral view of adult male cloudless sulphur, Phoebis sennae (Linnaeus), nectaring at smallfruit beggarticks, Bidens mitis. Photograph by Marc C. Minno, University of Florida. 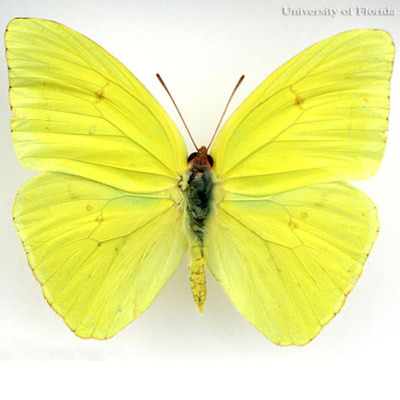 The cloudless sulphur is widspread in the southern United States, and it strays northward to Colorado, Nebraska, Iowa, Illinois, Indiana and New Jersey (Minno et al. 2005), and even into Canada (Riotte 1967). It is also found southward through South America to Argentina and in the West Indies (Heppner 2007). Adults: Wing spans range from 4.8 to 6.5 cm (approximately 1.9 to 2.6 in) (Minno and Minno 1999). Adults are usually bright yellow, but some summer form females are pale yellow or white (Minno and Minno 1999, Opler and Krizek 1984). Females have a narrow black border on the wings and a dark spot in the middle of the front wing. Males are seasonally dimorphic with winter forms being larger and with darker markings ventrally (Opler and Krizek 1984). Figure 2. Adult female cloudless sulphur, Phoebis sennae (Linnaeus), lateral view. Photograph by Marc C. Minno, University of Florida. Figure 3. Adult female cloudless sulphur, Phoebis sennae (Linnaeus), dorsal view. Photograph by Donald Hall, University of Florida. Figure 4. Adult female cloudless sulphur, Phoebis sennae (Linnaeus), ventral view. Photograph by Donald Hall, University of Florida. Figure 5. Adult male cloudless sulphur, Phoebis sennae (Linnaeus), dorsal view. Photograph by Donald Hall, University of Florida. Figure 6. 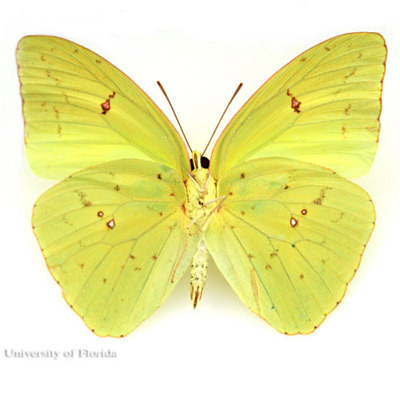 Adult male cloudless sulphur, Phoebis sennae (Linnaeus), ventral view. Photograph by Donald Hall, University of Florida. Eggs: The eggs are cream colored when laid but later turn to orange. Figure 7. 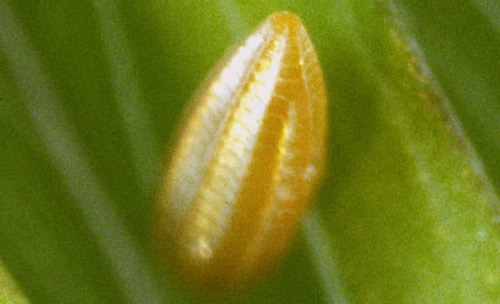 Egg of the cloudless sulphur, Phoebis sennae (Linnaeus). Photograph by Jerry Butler, University of Florida. Figure 8. First instar larva of the cloudless sulphur, Phoebis sennae (Linnaeus), emerging from egg. Photograph by David Almquist. 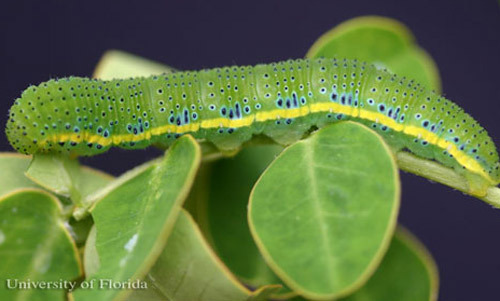 Larvae: The larvae are green with yellow lateral lines and blue patches and transverse bands of tiny blue spots bearing black setae. Larvae that feed predominantly on flowers are yellow with black transverse bands (Minno et al. 2005). Figure 9. 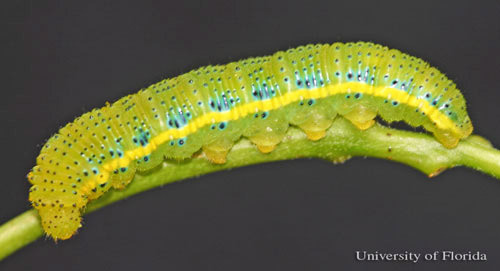 Green larva of the cloudless sulphur, Phoebis sennae (Linnaeus). The head is to the left. Photograph by Jerry Butler, University of Florida. Figure 10. Green larva of the cloudless sulphur, Phoebis sennae (Linnaeus). Head is to the left. Photograph by Marc C. Minno, University of Florida. Figure 11. Yellowish larva of the cloudless sulphur, Phoebis sennae (Linnaeus). Head is to the left. Photograph by Marc C. Minno, University of Florida. Figure 12. Yellow larva of the cloudless sulphur, Phoebis sennae (Linnaeus). The head is to the left. Photograph by Jerry Butler, University of Florida. Pupae: The pupae hang vertically attached to a silk pad by the cremaster and also are supported by a silk girdle. 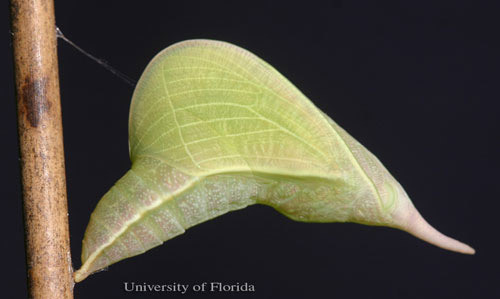 Pupae may be either green or pink with yellow lines (Minno and Minno 1999). Figure 13. A recently pupated cloudless sulphur, Phoebis sennae (Linnaeus). Photograph by Marc C. Minno, University of Florida. Figure 14. Green and pink pupae of the cloudless sulphur, Phoebis sennae (Linnaeus). Photograph by Marc C. Minno, University of Florida. Cloudless sulphurs may be found in all habitats when migrating, but breed in disturbed open areas where their caterpillar host plants and nectar plants are found. They have relatively long tongues and can reach the nectar of some tubular flowers that some other butterflies cannot (May 1992). Red flowers are preferred (Glassberg et al. 2000). In Florida, they frequently nectar at the red morning-glories, scarlet creeper (Ipomoea hederifolia) and cypressvine (Ipomoea quamoclit) (Convolvulaceae), and also at scarlet sage, Salvia coccinea (Lamiaceae). Males sometimes drink from mud. Figure 15. An adult female cloudless sulphur, Phoebis sennae (Linnaeus), feeding at scarlet sage, Salvia coccinea. Photograph by Donald Hall, University of Florida. Males patrol for females throughout the day (Cech and Tudor 2005) and especially around nectar plants (May 1985). Rutowski (1983) studied the mating behavior of cloudless sulphurs by tethering reared females to host plants (that were visited by both females and males) with threads and filming the mating sequence. The male initiated courtship by making contact with the female's wings either with his wings or legs. A receptive female usually flicked her wings and then closed them. Unless the female assumed a "mate refusal" posture (open wings and raised abdomen) the male landed beside her with his head pointing in the same direction as hers. The male then inserted the tip of his abdomen between the female's hind wings to couple with her. Throughout this time the male flapped his wings. After coupling, he then attempted to fly off with her, but was prevented from doing so by the tether. In a few cases his attempts to couple were unsuccessful and he moved to the other side of the female and was then usually successful. 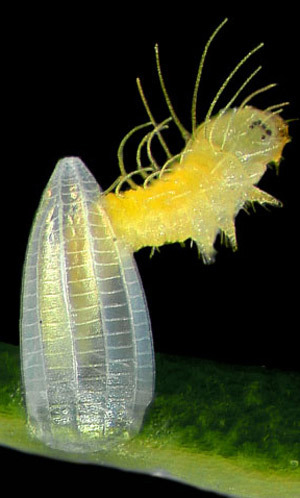 Eggs are laid singly on the host plant. 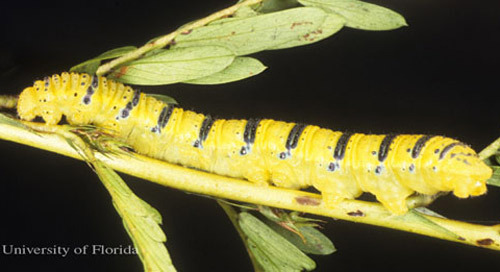 Larvae live exposed (no shelter) and feed on foliage, buds and flowers. Development is continuous and none of the immature stages are capable of diapause. Winter form adults probably undergo reproductive diapause (Opler and Krizek 1984). At night, on dark, cloudy days, and during storms, adult cloudless surphurs roost singly on leaves. Before settling, they are very choosey of just the right place. An adult preparing to roost makes an erratic flight around a potential tree or shrub, settling briefly at times, then flying about some more, and typically selecting a yellow or reddish leaf within other leaves on which to finally stop. This behavior may help prevent attacks from predators, such as birds, that may also be perching nearby and watching the activity. Although the adults are brightly colored when flying, they seem to disappear against similarly colored leaves in the shade. The roost site may be low to the ground in shrubs with lots of foliage or high up in the leaves of trees. 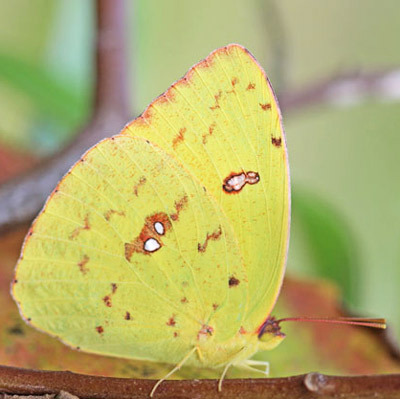 The fall migration of cloudless sulphurs is the easiest to observe butterfly migration in the southeastern United States. On fine days in the fall, in the Southeast, any butterfly watcher driving an east-west road through open country will likely see these bright yellow butterflies crossing the road and can confirm that they are crossing much more frequently from north to south than from south to north. (Monarchs are migrating at the same time, but they generally fly too high to see and are heading for Mexico and hence may miss the Southeast.) During fall, the numbers of cloudless sulphurs crossing an east-west line bisecting the Florida peninsula at the latitude of Gainesville may approach the numbers of monarchs overwintering in clusters at highly localized sites in Mexico (Walker 1991, 2001). The seasonal migrations of cloudless sulphurs and monarchs are similar in that each species is abandoning large and favorable summer breeding areas that have lethally low winter temperatures for more favorable climates to the south. In the spring, surviving adults head northward and soon repopulate the summer breeding areas. In both species, the northward migration is evidenced by the reappearance each summer in the breeding areas they abandoned the previous fall. In cloudless sulphurs, quantitative comparisons of the fall and spring flights have been made based on the catches of passive flight traps (Walker 1985). These traps are successful because when cloudless sulphurs migrate through open areas most fly within 3 meters of the ground, and when they encounter a major obstacle, such as a house, they rise and fly over it rather than deviating from their migratory direction. When migrating butterflies strike the central barrier of such a trap and attempt to fly over it, they are deflected into cages that segregate the butterflies that have encountered the barrier on one side from those that have encountered it on the other. In fall, near Gainesville, between 1979 and 1993, flight traps oriented perpendicular to the axis of the Florida peninsula caught, on average, 504 more cloudless sulphurs flying southward than flying northward. In spring, their catch revealed a much smaller migration with 17 more flying northward than flying southward. In both migratory seasons about 90% of the total catch had been flying in the seasonally appropriate direction. In most years, some cloudless sulphurs probably successfully overwinter as far as 100 miles north of Gainesville, but in exceptionally frigid winters even Gainesville may have temperatures below 20°F that are likely lethal to cloudless sulphurs. The large numbers migrating each fall across the latitude of Gainesville suggest that most overwintering is to the south. 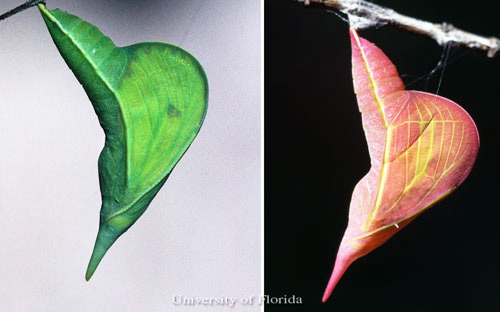 Fall and winter observations of butterflies in Florida south of Gainesville suggest that nearly all migrants stop before reaching the latitude of Lake Okeechobee (Lenczewski 1992). As reported by Walker (2001), the fall migrations of cloudless sulphurs through Gainesville declined sharply between 1984 and 2000. Reduced planting of soybeans and more use of herbicides to control sicklepod in soybean fields may have caused, or at least contributed to, the decline. In summarizing his own and his associates' research on butterfly migrations in the Southeast U.S. between 1960 and 2000, Walker (2012) made openly accessible the trapping and azimuth data that are the basis of his major papers. Plant names are from Wunderlin et al. (2019) or the USDA PLANTS Database. 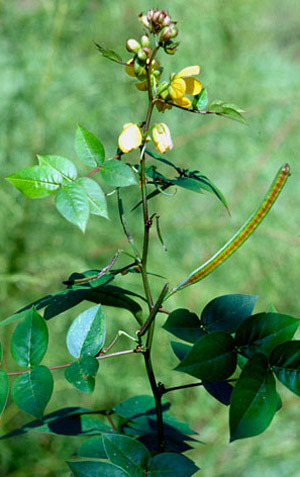 Senna pendula var. 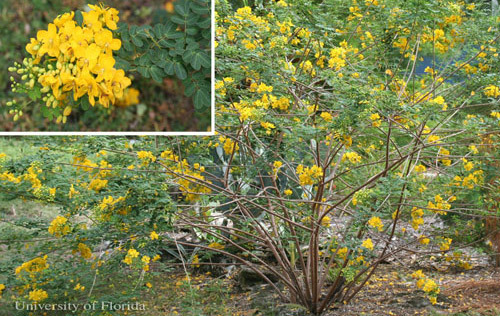 glabrata, a common cultivated ornamental bush in Florida, is also known as Christmas senna or butterfly bush and is commonly (and erroneously) referred to by the scientific name Cassia bicapsularis (now Senna bicapsularis). 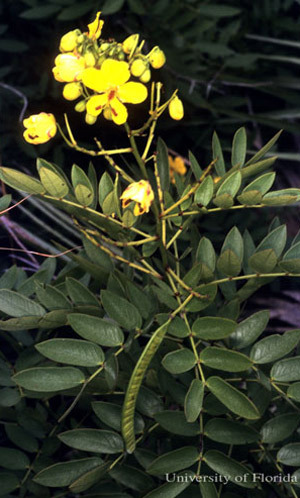 Senna bicapsularis is very similar to Senna pendula, but is rarely planted in Florida (Isely 1990). Figure 16. Partridge pea, Chamaecrista fasciculata, a host of the cloudless sulphur, Phoebis sennae (Linnaeus). Photograph by Donald Hall, University of Florida. Figure 17. Sensitive pea, Chamaecrista nictitans, a host of the cloudless sulphur, Phoebis sennae (Linnaeus). Photograph by Donald Hall, University of Florida. Figure 18. Privet wild sensitive plant, Senna ligustrina, a host of the cloudless sulphur, Phoebis sennae (Linnaeus). Photograph by Deborah Lott, University of Florida. Figure 19. 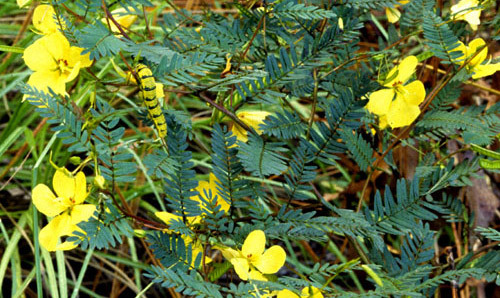 Chapman's wild sensitive plant, Senna mexicana var. 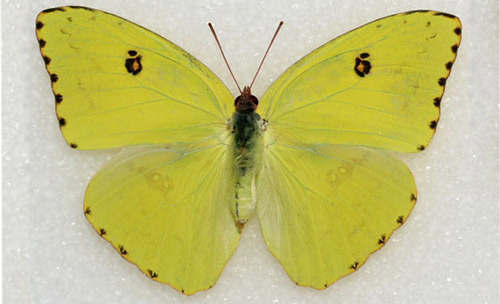 chapmanii, a host of the cloudless sulphur, Phoebis sennae (Linnaeus). Photograph by Donald Hall, University of Florida. Figure 20. Candlestick plant, Senna alata, a host of the cloudless sulphur, Phoebis sennae (Linnaeus). Photograph by Marc C. Minno, University of Florida. Figure 21. Coffeeweed, Senna obtusifolia, a host of the cloudless sulphur, Phoebis sennae (Linnaeus). Photograph by Marc C. Minno, University of Florida. Figure 22. Septic weed, Senna occidentalis, a host of the cloudless sulphur, Phoebis sennae (Linnaeus). Photograph by Marc C. Minno, University of Florida. Figure 23. 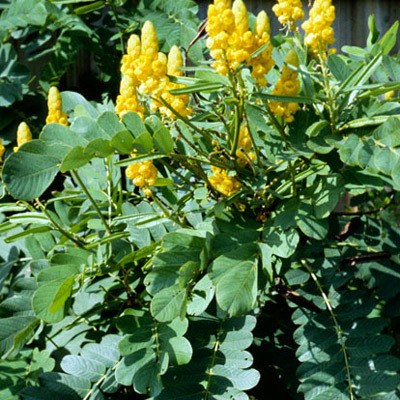 Valamuerto, Senna pendula var. glabrata, a host of the cloudless sulphur, Phoebis sennae (Linnaeus). Photograph by Donald Hall, University of Florida. Chamaecrista species have extrafloral nectaries on the leaf petioles to attract predacious ants for protection from herbivores. Ants have been observed removing eggs and small larvae of Phoebis sennae from Chamaecrista fasciculata (Barton 1986). 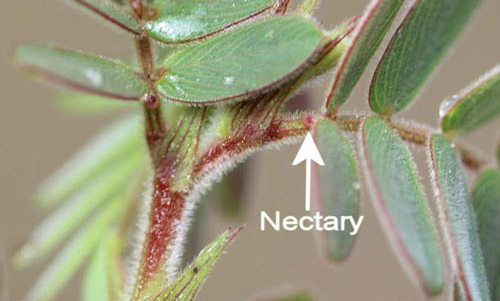 Senna mexicana, Senna obtusifolia, Senna occidentalis, Senna pendula, Senna marilandica, Senna surrattensis, and Senna ligustrina also have extrafloral nectaries on the leaf petioles (Isely 1990, Marazzi et al. 2006) and probably also gain some protection from Phoebis sennae larvae and other herbivores. 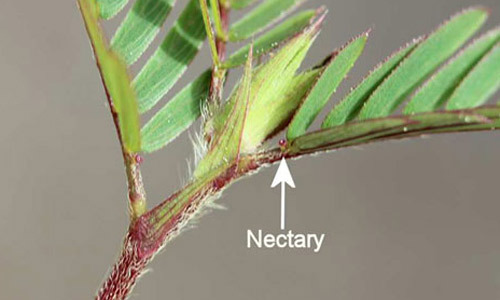 The extrafloral nectaries of Chamaecrista species are cup-shaped with a concave central disc while those of most Senna species are bud-shaped or button-shaped and convex. Figure 24. Extrafloral nectary of sensitive pea, Chamaecrista nictitans var. 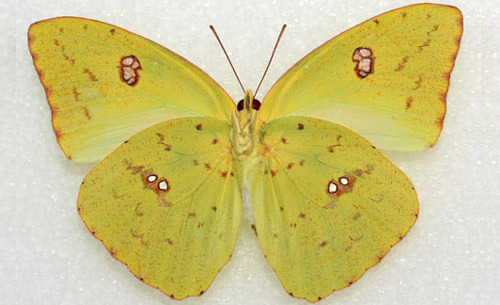 aspera, a host of the cloudless sulphur, Phoebis sennae (Linnaeus). Photograph by Marc C. Minno, University of Florida. Figure 25. Extrafloral nectary of Florida Keys sensitive pea, Chamaecrista deeringiana, a host of the cloudless sulphur, Phoebis sennae (Linnaeus). Photograph by Marc C. Minno, University of Florida. Figure 26. Extrafloral nectary of narrowpod sensitive pea, Chamaecrista lineata, a host of the cloudless sulphur, Phoebis sennae (Linnaeus). Photograph by Marc C. Minno, University of Florida. Figure 27. 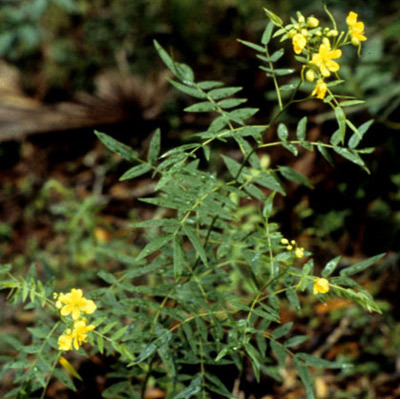 Extrafloral nectary of Chapman's wild sensitive plant, Senna mexicana var. chapmanii, a host of the cloudless sulphur, Phoebis sennae (Linnaeus). Photograph by Marc C. Minno, University of Florida. Figure 28. 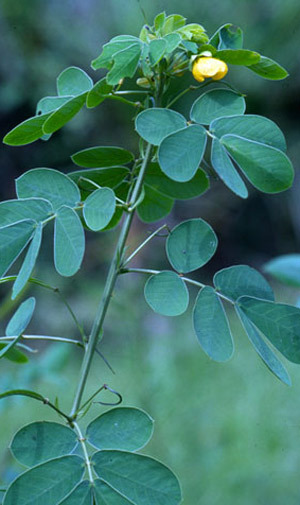 Extrafloral nectary of valamuerto, Senna pendula var. glabrata, a host of the cloudless sulphur, Phoebis sennae (Linnaeus). Photograph by Donald Hall, University of Florida. Kopter et al. (2013) observed the midge, Forcipomyia (Microhelea) eriophora (Williston) (Diptera: Ceratopogonidae) feeding on Phoebis sennae larvae. Larvae fed upon by the midges suffered higher mortality in captivity than occurred in laboratory reared larvae. 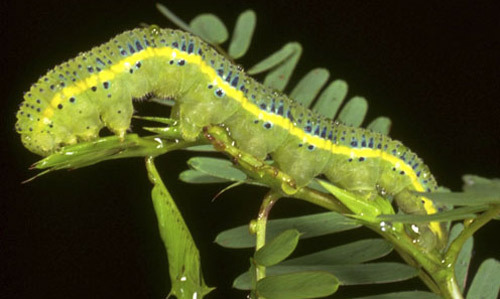 Cloudless sulphur larvae eat the foliage, buds and flowers of ornamental sennas. If necessary, they can be controlled by hand-picking. Chemical control is neither required nor recommended. Barton AM. 1986. 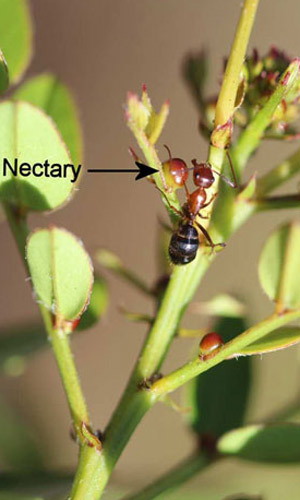 Spatial variation in the effects of ants on an extrafloral nectary plant. Ecology 67: 495-504. Cech R, Tudor G. 2005. Butterflies of the East Coast: An Observer's Guide. Princeton University Press. Princeton, New Jersey. USA. 345 pp. Fleet RR, Young BL. 2000. 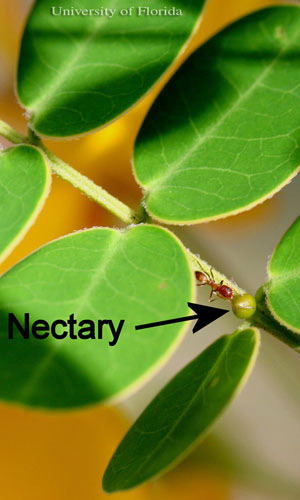 Facultative mutualism between imported fire ants (Solenopsis invicta) and a legume (Senna occidentalis). Southwestern Naturalist 45: 289-298. Heppner JB. 2007. Lepidoptera of Florida. Part 1. Introduction and Catalog. Arthropods of Florida and Neighboring Land Areas. Vol. 17. Florida Department of Agriculture & Consumer Services. Division of Plant Industry. Gainesville, FL. 670 pp. Isely D. 1990. Leguminosae (Fabaceae). Vascular Flora of the Southeastern United States. Vol. 3, Part 2. The University of North Carolina Press. Chapel Hill, USA. 258 pp. Kopter S, Pena JE, Grogan WL. 2013. The biting midge, Forcipomyia (Microhelea) eriophora (Williston) (Diptera: Ceratopogonidae), an ectoparasite of larval Phoebis sennae (Pieridae) in South Florida. Journal of the Lepidopterists Society 67: 128-130. Marazzi B, Endress PK, Paganucci de Queiroz L, Conti E. 2006. Phylogenetic relationships within Senna (Leguminosae, Cassiinae) based on three chloroplast DNA regions: patterns in the evolution of floral symmetry and extrafloral nectaries. American Journal of Botany 93: 288-303. May PG. 1985. Nectar uptake rates and optimal nectar concentrations of two butterfly species. Oecologia 66: 381-386. May PG. 1992. Flower selection and the dynamics of lipid reserves in two nectivorous butterflies. Ecology 73: 2181-2191. Mexzón RG, Chinchilla CM. 2003. 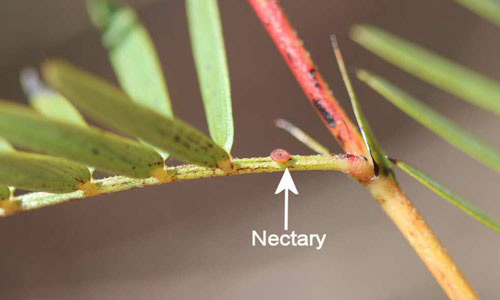 Especies vegetales atrayentes de la entornofauna benéfica en plantaciones de palma de aceite (Elaeis guineensis Jacq.) en Costa Rica (Plant Species Attractive to Beneficial Insects in Oil Palm [Elaeis guineensis Jacq.] Plantations in Costa Rica). Palmas 24: 33-57. Riotte JCE. 1967. New and corrected butterfly records for Ontario and for Canada. Journal of the Lepidopterists' Association 21: 135-137. Rutowski RL. 1984. 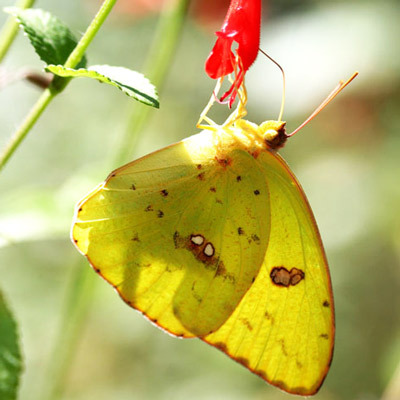 Courtship leading to copulation in the cloudless sulphur, Phoebis sennae (Pieridae). Journal of Research on the Lepidoptera 22: 249-253. Authors: Donald W. Hall, Marc C. Minno and Thomas J. Walker, University of Florida, Entomology and Nematology Department. Photographs: Donald W. Hall, Marc C. Minno, Jerry Butler and Deborah Lott, University of Florida, Entomology and Nematology Department; David Almquist. Publication Date: March 2012. Latest Revision: March 2016. Reviewed: February 2019.